Progress! The second board for my N-club modules is wired and the three point motors fitted. The wiring looks neater in the photograph than in reality, but it is at least all held in place with hot glue, and the wire colours are reasonable consistent. Not entirely, as it’s impossible to maintain colours on a ladder of pointwork with the live frogs feeding each other. Next was how to get power to the tracks. The square platform in the centre of the board is to hold a small sealed box transformer. I was originally going to tie this in place, but consulting with Mr Atfield it was suggested that mains electricity on baseboards was verboten. However, I wasn’t convinced, and retreated to my books and the internet. I found Mr Rice suggesting a ‘sealed’ (i.e. 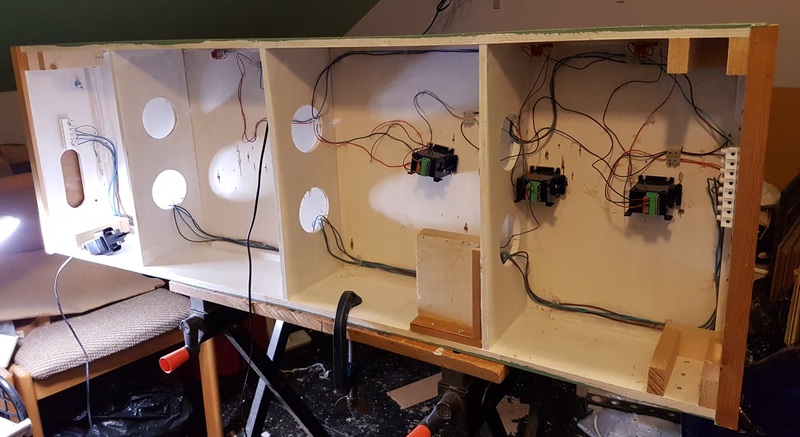 a wooden box with a screw on cover) compartment for the transformer within his ply baseboard structure. 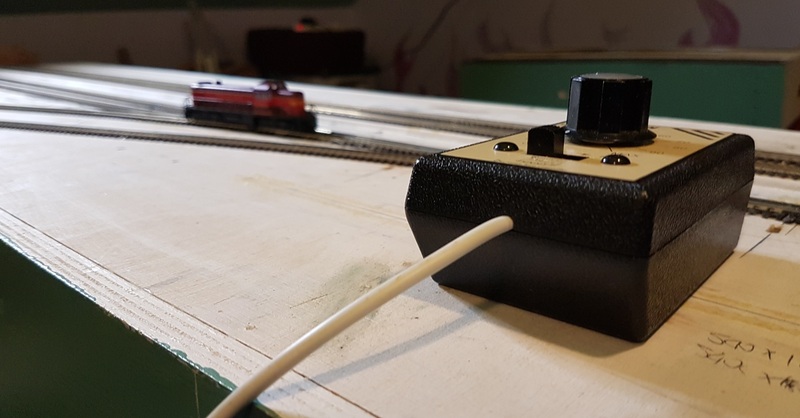 A widely exhibited large narrow-gauge layout described how the sealed transformer was tied to the underside of his layout – and this is obviously acceptable to exhibitions. So I went for a compromise. The transformer is tied to the platform with cable ties, and is easily removable, but can remain in situ for transport. A plug power supply is needed for the Cobalt point motors. Both supplies are plugged into an extension lead fixed to one of the leg units, and hence is not part of the main baseboard. And I plugged in my old Gaugemaster hand-held controller and the test loco (an old Rock Island Kato RS-2) happily ran over the whole board. Back to where I was a year ago when I decided to rebuild the modules….. Since these photos, the two boards have had a quick spray with ‘sleeper grime’ (remembering to mask the moving areas of the points – I’ll hand paint these later.) I’ve sketched out roughly where the buildings will go, and found the appropriate kits in my gloat box of American buildings. Now on to making some buildings and ballasting the main lines. I’m not sure what to do in the yard – I’m wondering whether to just fill the track to rail level as general grime and gunge. This entry was posted in ESNG, Jon's layout ramblings, On my workbench and tagged ESNG, model railway, N gauge. Bookmark the permalink. Never thought of tacking down the wires with hot glue. I am always fooling about with clips and staples and such. Great idea! It’s a bit untidy – I can never make neat hot glue spots – but works really well.